provides new insight into the nature of a mysterious class of black holes that can produce as much energy in X-rays as a million suns radiate at all wavelengths. Researchers used Chandra to discover a new ultraluminous X-ray source, or ULX. These objects give off more X-rays than most binary systems, in which a companion star orbits the remains of a collapsed star. These collapsed stars form either a dense core called a neutron star or a black hole. The extra X-ray emission suggests ULXs contain black holes that might be much more massive than the ones found elsewhere in our galaxy. The companion stars to ULXs, when identified, are usually young, massive stars, implying their black holes are also young. The latest research, however, provides direct evidence that ULXs can contain much older black holes and some sources may have been misidentified as young ones. 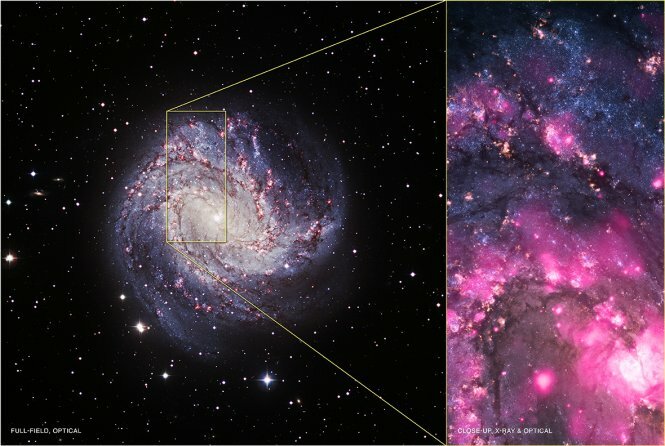 The intriguing new ULX is located in M83, a spiral galaxy about 15 million light years from Earth, discovered in 2010 with Chandra. The sudden brightening of the M83 ULX is one of the largest changes in X-rays ever seen for this type of object, which do not usually show dormant periods. The companion to the black hole in M83 is likely a red giant star at least 500 million years old, with a mass less than four times the sun’s. Theoretical models for the evolution of stars suggest the black hole should be almost as old as its companion. Another ULX containing a volatile, old black hole recently was discovered in the Andromeda galaxy by Amanpreet Kaur, from Clemson University, and colleagues and published in the February 2012 issue of Astronomy and Astrophysics. How Much Does Our Milky Way Waigh?